MATTHEW WILDER "BREAK MY STRIDE"
What an 80s fest this video clip is. I'm not sure which is more eighties, Matthew Wilder's dodgy hair and tash, or the young ladies jiggling their bottom cheeks in skimpy leotards? What I do know is that it's too early in the morning for me to be viewing this - I'll save it for later! Matthew Wilder was originally one half of the 70's pop duo Matthew & Peter, before moving from the New York area to Los Angeles in 1978 and singing in TV commercials. He also worked as a backing singer. 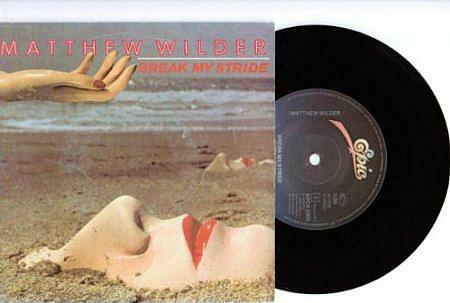 While in California, Wilder started a solo career and released the album I Don't Speak The Language in 1983. Break My Stride was released as a debut single and proved to be Wilder's biggest hit, reaching #5 in the Billboard Hot 100 and #4 in the UK. The American singer/songwriter experienced moderate success with another single from the same album entitled The Kid's American, which peaked at #33 in the U.S. during 1984. Unfortunately, this flopped in the UK reaching only #93 and making him an 80s one hit wonder. Another album entitled Bouncin' Off The Walls was released in 1985 but only reached #52 in America, and with no hit singles Matthew Wilder's solo career collapsed. However, Wilder continued to work as a music producer and songwriter and has produced music for the Disney film Mulan (1998). He has also worked with Christina Aguilera, Miley Cyrus and Kelly Clarkson.